In 1985, after Mikhail Gorbachov the Secretary General of the Central Committee of the Soviet Communist Party, declared “a course of restructuring and openness”, changes started in the Soviet Union with regard to at least little independence for its republics. The reborn national ideals in the Baltic grew stronger, eventually evolving into a general awakening, lead by the Latvian Popular Front (LPF) and the National Independence Movement (LNIM). People from artistic and intellectual milieu, including lawyers, became actively involved in the process of awakening. A LPF support group was established also at the Supreme Court, headed by the judge Andrejs Lepse. Members of the support group met regularly, discussed topical issues in the activities of the Popular Front, collected donations for the LPF Fund, distributed the newspaper “Atmoda” (The Awakening), were on duty at the headquarters of the Front. During the period of awakening the frequency of confrontations between demonstrators, protesters and the militia increased. The militiamen often detained the protesters, but judges often did not give approval for the acts of militia and released the detainees. Usually the Prosecutor’s office of the Latvian SSR protested against these decisions; however, the Supreme Court did not revoke them and terminated the cases. The Plenary Session of the Supreme Court before de facto restoration of state independence and creation of the legal basis needed for the judicial reform passed historically important and courageous decisions. For example, to prevent the impact of the Communist Party upon courts, the Plenary Session requested the incumbent Supreme Court of the Latvian SSR to declare unlawful all decisions of court and out-of-court institutions, on the basis of which, in accordance with the laws of the occupying state, Latvian inhabitants had been subject to repressions, to rehabilitate them. 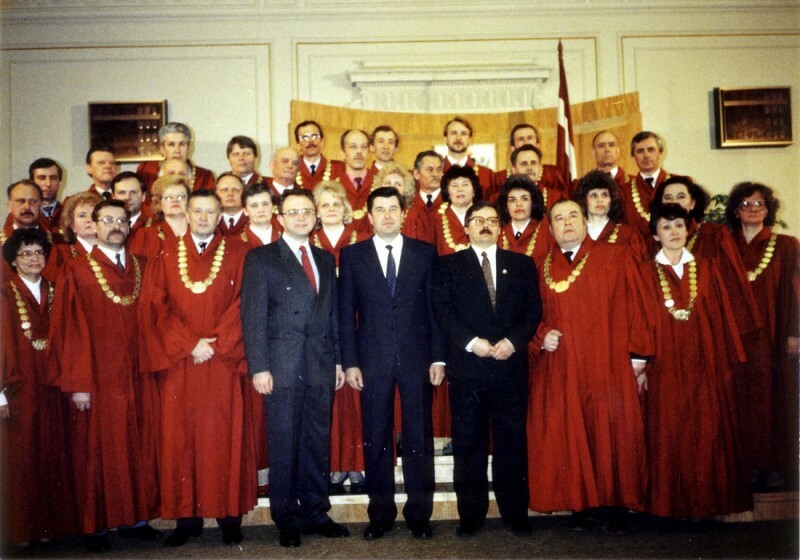 On 4 May, 1990, the LSSR Supreme Council passed the declaration “On Restoring the Independence of the Republic of Latvia”. This had the legal effect of a constitution, reinstating the four Articles of the Satversme of independent Latvia that set forth the constitutional and legal basis of the Latvian State. The Constitutional law “On the Political Status of the Republic of Latvia”, of 21 August 1991, in this turn, fully restored the Latvian political system under the Satversme of 15 February, 1922. State institutions acquired not only new names, but also new contents to their activities. 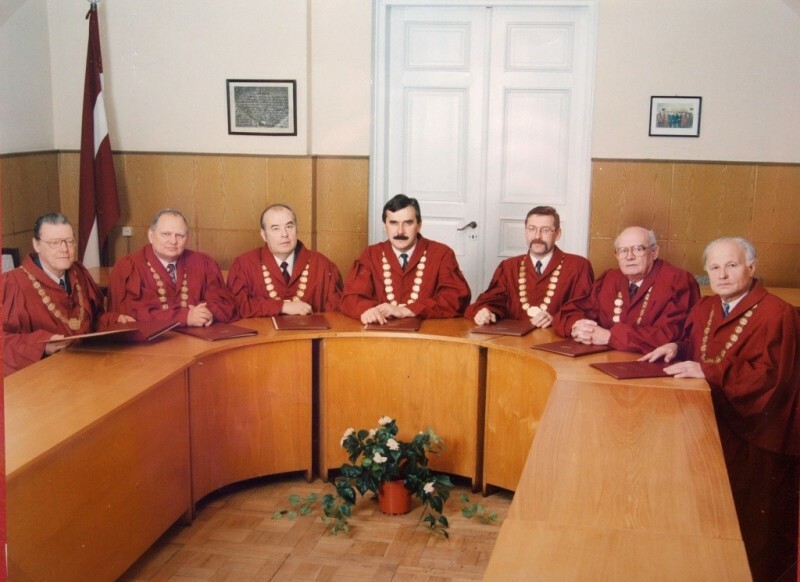 The Supreme Court of the Latvian SSR was renamed the Supreme Court of the Republic of Latvia. 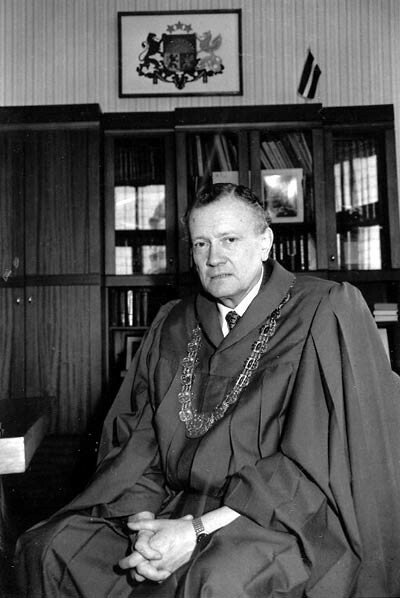 On 16 May 1990 Anatolijs Gorbunovs, the Chair of the Supreme Council of the Republic of Latvia, proposed Gvido Zemribo as the candidate for the office of chief Justice of the Supreme Court. Zemribo had been the Chief Justice of the Supreme Court since 1885 and was supported by the deputies and entrusted with the task to continue working and create the Supreme Court of the independent Republic of Latvia. 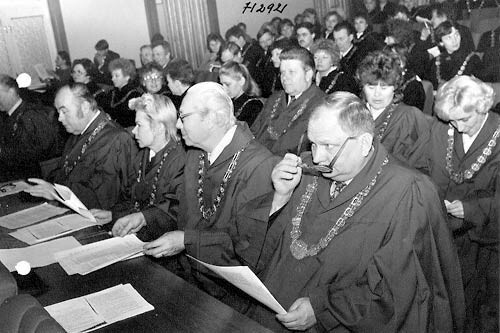 On 11 March 1991, the Plenary Session of the Supreme Court passed the decision “On the Independence of the Judiciary of the Republic of Latvia” which for the first time contained the basic principles of international standards for adjudicating cases and independence of the judiciary. On 8 April, the Judges of the Supreme Court, wearing official robes and insignia, made according to the sample of official robes of the Senate of Latvia, went to the Supreme Council for the first swearing in ceremony.